Now this is pretty amazing. 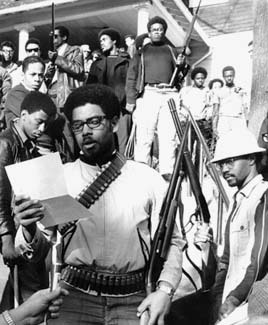 Me last week at the Mehserle verdict demonstration, among a crowd facing an enormous swarm of riot police; my dad in 1969 at Cornell University, when a group of Black students armed themselves and took over a campus building. Not that the two situations are comparable in terms of danger, of course — it’s a miracle the Willard Straight Takeover didn’t explode into a bloodbath, whereas in Oakland, despite all the state weaponry, I never really believed that the cops would kill us right there on the spot. But what an uncanny visual of a family lineage — the twin furrowed brows, the calm mouths, the keen watchfulness. Taking it in. Trying to solve the problem at hand, to find a peaceful but effective way forward. There’s a story here about non-dualistic inheritance: a story about how none of us is really our own discrete self. How each individual, living in the present moment, also spans generations into the past. Reading Thich Nhat Hanh’s Teachings On Love last year brought this idea home for me for the first time. The subtle ways we manifest traumas, neuroses, wounds, strengths, and gifts from our ancestors. And when Rumi says, “This being human is a guest house/ Every morning a new arrival,” I suppose that leaves room for your own father to drop in for a spell. Just did it now. Would love to hear how meditation worked for you last night. I’ve been bad about mine—I mean, other than the living it, my intentional practice has atrophied. Start my job tomorrow. So probably the soonest we could meet up would be this weekend. The similarity is striking, but you and I know that there is much more going on behind your brow than mine. The Dad is but a mere shadow of the woman.